Peacekeepers from the elite Nepalese reserve forces have provided life-saving assistance to the people of war-torn South Sudan for almost a year. They demonstrated their efforts to protect civilians in a dramatization of the rules of engagement they operate under during a special medal ceremony in the capital Juba today. The sound of fake gunfire rang out across the compound as actors mimicking an armed group attacked a convoy of trucks and looted its contents. Within seconds, a Nepalese armoured personnel carrier and peacekeeping troops rushed to the scene issuing a warning to the aggressors before firing back to deter their continuing attack on civilians and soldiers. The dramatization was very similar to the situation the troops encountered in June, when a humanitarian convoy they were protecting came under attack from an armed group in the south of the country, resulting in the death of fellow peacekeeper Lieutenant Commander Ashraf Siddiqui from Bangladesh. The Head of UNMISS, David Shearer praised the robust response of the Nepalese forces in that situation, saying their efforts had deterred the attackers and saved other lives. The commander of the Nepalese contingent said that his countrymen and women were committed to continuing their quest for global peace despite the risks. Nepal’s reserve force battalion in South Sudan protect civilians by patrolling across the country, facilitate the safe delivery of humanitarian aid and provide a secure environment for displaced people living in UN protection camps. 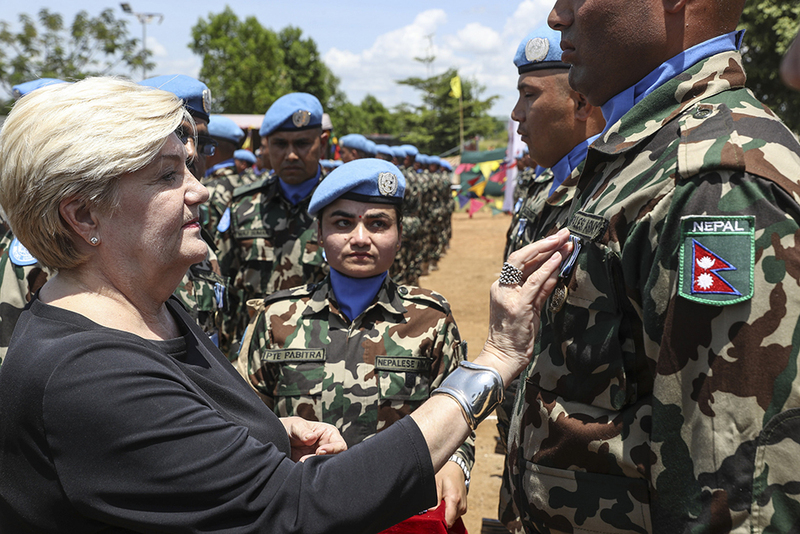 Those receiving the UN medal today have served in South Sudan since October 2017. More than 122,000 Nepalese peacekeepers have served in UN missions over more than 60 years. Currently, 5,027 troops are serving in 12 different missions. Just over 1,700 are working with the people of South Sudan to protect civilians and build durable peace.